IWC. A black PVD coated stainless steel automatic calendar chronograph wristwatch with split seconds. 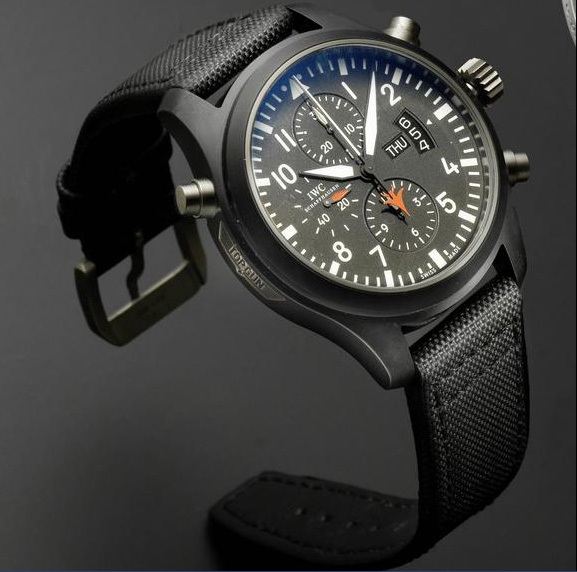 Top Gun Edition, Ref:3799, Case No.3309930, Jeweled automatic movement, matt black dial with white Arabic numerals and luminous baton quarters, white outer minute divisions with five minute markers, black sword hands with luminous inserts, white center chronograph hands with red stylized arrow tips, subsidiary dials at 6, 9 and 12 for running seconds, 30 minute and 12 hour recording, day and date registers at 3, black PVD coated tonneau case with screw down back, screw down crown flanked by twin chronograph buttons, button at 10 for split seconds, fitted black IWC leather strap with brushed signed buckle, together with original fitted IWC box, warranty card and additional strap, case, dial and movement signed. 46mm.